Our recommended treatment choice for getting rid of green water algae and blue-green algae. As the name suggests, UV clarifiers make use of strong UV light to destroy the cells of algae, causing them to clump together and be removed through your filter system. A UV clarifier is attached to your pond pump, or it can come combined with some filters, and as water passes through the main chamber UV light penetrates the water and destroys the free-swimming algae causing green water. For ponds with green water problems, UV clarifiers are the single most effective solution, especially if you also have fish in your pond. Unlike some other algae treatments, UV clarifiers are 100% safe for fish and actually can provide health benefits. Along with the removal of algae, the UV will also destroy harmful free-swimming bacteria and viruses present in the water which can cause fish to become sick, effectively purifying the water. UV clarifiers can be purchased as a separate unit, or can be purchased combined with a filter box – either choice is fine! For small ponds, a UV wattage from around 2-5w should be more than sufficient to clear all green water algae within a week, and for larger ponds, a wattage of 5-12w should suffice. During treatment, it is highly recommenced to clear your filter media regularly, as the dead algae will rapidly begin to clog the mechanical media. As well as this, a pond vacuum or net can be used to remove any dead algae build up on the floor of the pond for extra water clarity and to help prevent algae growth in future. A downside of UV clarifiers is that they won’t be able to remove larger algae, such as string algae, that is attached to the sides of the pond. Only free-swimming algae that enters the main chamber will be destroyed by the UV light. It’s best to manually remove string algae with a vacuum or net alongside the UV treatment for best results. UV clarifiers can be run 24/7 during the summer months without problems, and pond owners with fish often choose to do this to reduce harmful bacteria levels alongside the algae removal. For more information on UV clarifiers and the best models, check our full guide here. Another method of algae removal which is especially useful for removing larger string algae is to simply scoop it out manually! Basic pond nets will be able to remove most blanketweed on the pond surface, as well as most string algae on the sides. They’re less effective when trying to remove bottom algae and sludge, but are a very cheap option for pond owners on a budget. If you’d prefer a quicker option with less manual work, pond vacuums are a good investment for pond owners who find themselves regularly cleaning their pond. Vacs can quickly remove all string algae and blanketweed in a fraction of the time compared to a pond net. They also provide fantastic all-round pond cleaning, being able to remove sludge and muck build up which can contribute to algae growth. These methods will not be able to effectively remove most free-swimming green water algae, however, so would be best combined with a UV clarifier for maximum results. Making use of both methods will ensure much clearer pond water, and help prevent further algae growth by removing excess nutrient sources, such as bottom muck. Pond vacuums are quite an expensive investment, and may be overkill for very small ponds where a basic net would probably be enough. For larger ponds, or for pond owners who want life a little easier, a quality pond vacuum is a very good long-term investment for algae control and general pond maintenance. Unlike chemical algaecides which work to destroy the cell walls of algae and need to used very carefully, natural removers, like Nualgi Ponds Algae remover, work with your ponds natural eco-system to remove algae at the source. Nualgi Ponds natural algae remover is a great alternative to harsh chemical algaecides, or for pond owners who want to save money by switching off their UV clarifier unit once in a while. This product removes algae by fighting fire with fire – using its own type of algae (a good kind) against nuisance pond algae (the bad kind). When you add this product to your pond it promotes the growth of an algae called Diatom, which is a silica-body based form of algae. Unlike regular pond algae, this type of algae is a favorite food for a natural pond microorganism called zooplankton. As it grows, it competes with normal algae for nutrients, eventually starving it and completely replacing it in your pond. It does this by being able to carry out photosynthesis much earlier in the day compared with normal algae, quickly being able to out-grow it. When normal algae die off, zooplankton will keep the new diatom algae in check by consuming it. In turn, zooplankton numbers grow, and if you have pond fish, they’ll enjoy eating the extra zooplanktoon, which is a favorite of koi and goldfish. This type of algae treatment is basically a method of strengthening your ponds natural eco-system and nitrogen cycle, creating a balance which prevents normal algae from becoming too abundant. It works good for both green algae and some string algae, although we find manual removal of string algae is better. It can take a few weeks to fully see the results for a large pond, and it may not be the best option for a pond with a very heavy algae bloom with fish as faster removal would be more desired. With that said, it’s still a great alternative to some chemical products, and is worth a try if you want to save some money by turning off your UV clarifier. Something we would only recommend as a last resort for algae removal is the use of chemical algaecide treatments. These kind of algae removal solutions use harsh chemicals to destroy the cell walls of algae, causing death of contact. This makes algaecides a very potent and effective treatment for algae, being to get rid of algae in a matter of days. The problem with chemical algaecides is that they can be very dangerous to fish and plants, especially in heavy stocked ponds or smaller ponds. You should not even consider using a chemical algaecide in a fish stocked pond with low aeration (flow & oxygen), as this is a recipe for disaster. Due to the speed in which these treatments destroy algae, there will be huge drops in dissolved oxygen throughout the pond. As algae die, they fall to the bottom of your pond and begin to decompose. The bacteria which causes the decomposition process require large amounts of oxygen to work, and with so much algae dying off at once, the bacteria will be effectively consuming almost all the ponds contents. This is less a problem in ponds without fish, as pond plants are much hardier when it comes to these kind of treatments. So long as the algaecide is not directly added on top of your pond plants, it should not have any problems growing or staying healthy. Pond plants recover very well for treatments such as this, so it should not be able issue for them. In terms of ponds with fish, we would only recommend this algae removal method if you have low fish stocks, a large pond, and can also provide very high levels of aeration to the waters. This would be fountains, waterfalls, and dedicated oxygenation equipment. The oxygen depleted during the process needs to be replaced for fish to be safe! If you’re unsure about this, we recommend a natural treatment or a UV clarifier instead, as these are both much safer options for fish stocked ponds. For a full guide on algaecide treatments and steps on how to maximize safely while using them, check our guide here. Pond dyes are great for slowly algae growth, and also make water look great! An interesting solution that is a popular choice for large ponds and lakes are naturally colored water dyes. This treatment was initially used to improve water color, but has now been designed to also help block UV light, which slows the growth of pond algae. The dyes come in a range of colors, are 100% natural and safe for fish and pond plants. You can purchase large amounts of concentrated dye to treat huge lakes, or much smaller bottles intended for pond use (see picture). Although pond dyes will not be able to remove a heavy algae bloom effectively, they’re a great way to manage algae from returning after another treatment (i.e., UV clarifier) has been carried out, or to remove small amounts of algae before they can spread. The dyes are highly concentrated and work to shade the pond water, blocking the majority of UV light from penetrating and being used by the algae. Due to this, however, they will also slow the growth of new underwater plants, so it’s best to dose with dye in late spring or early summer when most plants have sufficiently grown. Pond dyes can be used safely with fish, and will also not harm frogs or other wildlife. It will take time for the best results, but they’re a very good control method when used alongside another treatment. We would recommend dyes for pond owners who may not want to run their UV Clarifier 24/7 to prevent algae return, as using a dye should be enough to greatly slow algae growth. They also make pond water look really great; which is always a bonus! Probably the best long term method of controlling algae growth and improving the natural eco-system of your pond is to plant more pond plants. Plants require the same essentials as algae to growth, and will directly compete with algae for sunlight, nutrients, and carbon dioxide. Someone with a heavily planted pond will likely have much less algae compared to a pond without plants, as algae would have no competition when it comes to growing. Pond plants also add oxygen to the water during the day, and help remove harmful in-organic substances during growth. Sadly, just adding more plants when you already have algae won’t just magically remove the problem. Adding pond plants is a very long term solution, and more a method to controlling the growth of algae than immediately treating it. An algae bloom would still need to be treated with another method to completely remove it, but having more pond plants will help prevent the same amount of algae returning in future. Any pond plants will compete with algae for nutrients, so you really can’t go wrong with most choices. Plants such as Hornwort and Water Lettuce, however, are especially good oxygenators, easy for beginners, and very hardy to the changing seasons – two very good choices to get started. Understanding Algae – What is it? A pond with heavy algae bloom, showing significant blanket weed growth on the surface water. The term “algae” refers to a diverse range of different aquatic plant-based organisms, ranging from microscopic algae found in ponds, to large seaweeds, such as the 100ft giant kelp. Algae found in garden ponds comes in a few varieties, including the “blue-green” algae, cyanobacteria, as well as regular green, brown, and red algae. Pond algae, like many other plants, grow through photosynthesis; converting sunlight, carbon dioxide (CO2), and nutrients into materials known as biomass, which is then used for growth. Where does pond algae come from? Algae is present in almost all forms of water, even purified tap water. Water companies during their water sterilization process will be able to kill most algae, but some small percentage will still remain in-tact. Algae produce spores to reproduce, and these spores have very tough shells, allowing them to survive even harsh water treatment. When you add water to your garden pond, it only takes a single algae or spore to begin a rapid algae bloom if conditions are right. This is why you commonly hear of major algae problems with new pond builds, especially those which have not been cycled correctly. Algae present in a new pond has no competition for nutrients, and very clear water for rapid photosynthesis. On top of this, new ponds which are not cycled have no established beneficial bacteria populations to break down dead algae, leading to spikes in substances which damage the natural cycle and aid in algae growth. The most common form of algae is phytoplanktonic (free swimming) alage, which includes the type that causes pond water to become green in color. This single-celled form of algae is what most pond owners will experience, with it usually appearing in early spring or summer. The algae consume sunlight, carbon dioxide, and nutrients to grow, and directly compete with pond plants for nutrients. Green algae is a major problem for new ponds, ponds with heavy amounts of waste, or ponds with poor filtration systems. Unlike other forms of algae (string algae), it is much easier to remove green algae and control its growth with treatments. A larger form of algae which is present on the surface of your pond liner, usually across the bottom and edges, stretching out into the water like a regular plant. String algae is particularly tough to remove, as manual removal can cause the algae to release spores which contribute to further growth in other areas of your pond. Even though it produces oxygen like other forms of algae, when it dies off, the bacteria which work to break it down consume a much larger chuck of dissolved oxygen. As well as this, string algae and blanketweed are not particularity pleasant to look at and can greatly reduce the clarity of pond water. Unlike the other forms of algae, blue-green algae is actually a bacteria called cyanobacteria, which grow through photosynthesis, similar to regular algae. Just like the other forms of algae it uses sunlight, carbon dioxide, and other nutrients to grow. Although invisible to the naked eye, blue-green algae can be clearly seen when it builds up and clumps together. It usually appears in summer during the hottest months, and appears as blue-green, or brownish clumps on the surface of the pond water. It can generally be removed with the same treatments as green algae. Do I need to remove algae from my pond? All ponds will have some amount of algae present, even if you can’t physically see it. 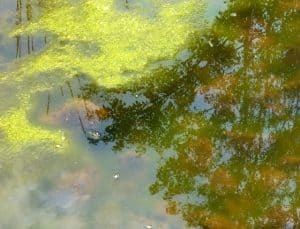 Problems arise when levels of algae become high enough to interfere with the ponds natural nitrogen cycle, causing spikes in ammonia, nitrates, and a high reduction in dissolved oxygen. 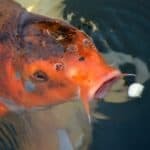 If you don’t have fish in your pond, this isn’t an immediate concern, but growing algae levels can cause sludge buildup which results in an unpleasant odor, and may also cause problems with water clarity, turning ponds a pea-green color. Pond plants will also have to compete with the algae for nutrients, meaning plants will suffer if algae volume is too high. If you have a fish-less garden pond, the choice to remove algae is more an aesthetic one. If you want clear water, or if you want to maximize plant growth, removing algae is recommended. The less algae present, the clearer your water will be, and the more nutrients your plants will have to grow strong. If you have fish in your pond, however, algae needs to be constantly monitored, as a spike in growth can seriously harm pond fish in a matter of days. Is algae safe for pond fish? Small amounts of algae will not cause harm to fish; in fact, some fish, such as koi, actually enjoy eating certain types of algae! Problems occur when algae growth spikes suddenly or gradual growth is left unchecked and algae populations begin to rise. Algae, like all photosynthesizing plants, will consume sunlight and carbon dioxide (co2) during the day and produce oxygen as a by-product. Pond fish require healthy levels of dissolved oxygen in water to breath, so if algae produce this, why is it harmful to fish? During the night when there is no sunlight, algae will instead consume nutrients, minerals, and oxygen from the water to sustain themselves. At the same time, as algae are all competing with each other (and pond plants) for nutrients, some will begin to die off as nutrients are consumed. As the algae die, they begin to decompose, and the bacteria that causes the process of decomposition consume large amounts of oxygen to function. This process will continue to repeat as algae grows, with dissolved oxygen levels rapidly decreasing as algae grow and die off. The oxygen produced by algae in the day cannot always keep up with the oxygen lost during the night during decomposition, so fish will slowly begin to suffocate. If you have fish in your pond, and algae has started to grow, you need to make sure the growth does not get out of control. A pond does not need to be fully green to be in danger, even a slight green tinge to the water is enough to prompt concern, especially in warmer months when oxygen levels are naturally lower. We recommend removing or reducing algae in fish ponds when you start seeing a green tinge to the water, or when you begin noticing large amounts of string algae growth appearing on the sides of the pond. What is causing the algae growth? New ponds are a prime target for algae growth, especially ponds which have not been correctly cycled ready for fish. Tap water will likely introduce algae spores to the new pond system, and with no competition for nutrients and plenty of sunlight, the algae can grow unchecked. This is less of a problem with fish-less ponds, and more a problem with ponds housing fish which have not been cycled prior to adding them. The lack of beneficial bacteria to break down waste products will cause a build up of fish waste, and spikes in substances that promote further algae growth. Before adding fish to a pond, it should be cycled and any algae already present removed to slow down future growth. Feeding pond fish too much food, or a low quality feed, can cause problems with algae growth. Fish waste will provide algae with nutrients for growth, and also contribute to sludge build up at the bottom of a pond. Low quality feeds will cause more waste as fish will not be able to use most of the contents, such as Ash, a common “filler” material. Carefully monitoring feeding amounts and making sure to only use high quality fish feeds is recommended to keep algae in check. Another common cause of algae growth, especially rapid algae growth, is the introduction of nutrients or fertilizers into the pond water. This is usually an issue where the edges of the pond liner have not been secured properly against the surrounding sediment, causing fertilizer to seep into the water. It can also be caused by using spray fertilizers too close to the pond, with the fertilizers entering from the surface. If you have pond plants, and are adding sediment or nutrients while planting, you should first make sure algae are controlled as they will quickly compete with the plants and slow their growth. A hole, tear, or leak in the pond liner could also be a cause of nutrients seeping into the water. If you notice a reduction in water level alongside sudden algae growth, you should check your liner for damage. Where the water is leaking, sediment and nutrients may also be entering the water, which can cause an algae bloom. Check here for help in repairing this kind of problem with pond liners. Algae, especially green free-swimming algae, thrive in stagnant pond water or water with very low movement. The lack of flow means the algae have a much easier time to establish themselves, and do not become trapped by the filter or pump. The lack of nutrient exchange also means the nitrogen cycle works less efficiently, allowing harmful substances which algae use to grow to build up. For small ponds, having a strong pond pump should provide sufficient flow and surface movement. For larger ponds, investing in a water feature, such as a fountain or waterfall, is a great way to provide more flow to the surface. I highly appreciate this recommendation to the fish farmers and technicians. I am going to try working with those methods to eradicate algae bloom in my nursery ponds. Thanks for your comment. I’m glad to hear the article has been helpful to you. Best of luck with the algae battle! Hopefully one of the methods does the trick.